There’s been a lot of talk about how voice-directed technologies are affecting the warehousing industry as of late. Despite some recent savvy technological developments, the world of warehousing logistics seems to be divided when it comes to investing in voice-operated systems. 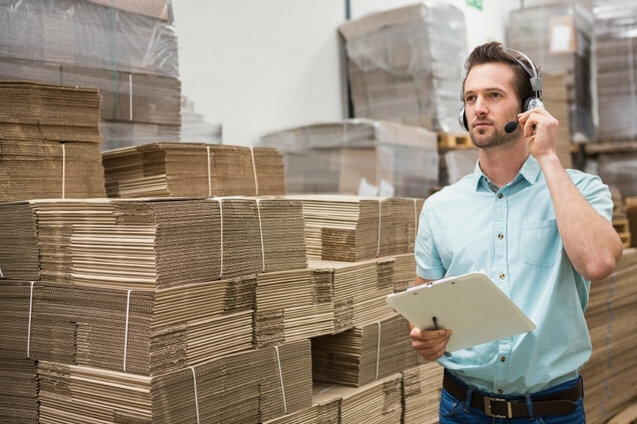 Many large-scale warehousing companies have incorporated voice technologies into their daily operations, citing increased accuracy and improved productivity. While smaller companies remain a bit skeptical of embracing voice-directed solutions for numerous reasons. It’s clear that voice technologies are having a powerful effect on the warehousing industry, but the extent of that effect remains to be unseen. Voice-directed systems can be a perfect fit for warehousing companies. Employees wear a hands-free headset and a portable computer on their belt that communicates directly to the warehouse management team. Pickers can fill orders without having to double check lists or digitally scan products one at a time, increasing productivity and accuracy all around. Incorporating voice-directed technology in warehousing management is nothing new. Some of the country’s largest distributers and suppliers have been using voice technology since the 90’s. In many industries, managers need to be in constant contact with warehouse workers and product handlers. Yet, many companies with smaller warehouse operations are still using paper-based lists and digital scanners to get through the day’s many orders. The latest voice technologies work in real time with warehouse management systems, keeping workers up-to-date on every task and order that comes their way. There’s no more guesswork or awkward handling of clipboards and paper lists, which might be out-of-date by the time the order is collected and processed. Headsets and portable computers are designed to be as unobtrusive as possible. Voice technology manufacturers are advertising their products to warehousing companies large and small, promising them nearly one hundred percent accuracy and a 5 percent increase in productivity. Voice technology makes perfect sense for larger corporations and warehouse distribution centers. If you have thousands of orders a day with over fifty employees running around, a voice-directed system can help streamline your entire process. Warehouses that have freezers with sub-zero temperatures will also benefit profoundly. Workers that have to wear thick gloves won’t have to worry about handling pens and paper. Larger corporations also have the resources to purchase a voice system and wait for ROI. Currently, voice technologies cost between $5,000 and $7,000 per operator. For other companies, the benefits do not outweigh the cost. A warehouse distribution center with only a handful of employees probably doesn’t need to worry about adding a voice-directed system. Additionally, warehousing companies with heavy background noise might not be able to hear voice commands as they’re given. The advantage of voice technology all depends on the nature of your warehouse’s operations. With major corporations such as Dunkin Donuts and 7-Eleven singing voice technology’s praises and smaller corporations keeping their distance, it seems the voice-directed revolution is only spreading so far. Many in the warehousing industry are waiting for the price of voice technology to drop. Once the price is right, voice technologies could spread rapidly throughout the warehousing industry. Until then, many companies will just have to wait until voice-directed solutions are within their grasp. Do you use voice technology in your warehouse? Let us know your thoughts in the comments section.